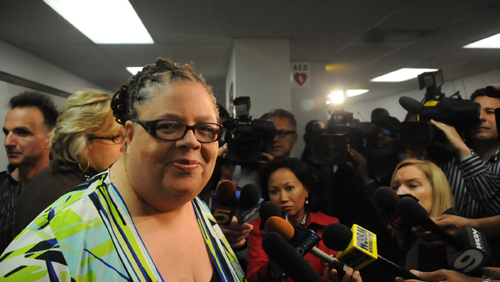 The newly appointed Chicago Board of Education voted unanimously at its first meeting to break the contract it has with the Chicago Teachers Union and the other unions representing organized CPS workers. The vote came after a brief executive session called when members of the Board became confused about whether they were supposed to vote for or against the Board Report on the agenda. The Board Report, which stated that the Board had a reasonable expectation of paying the four percent raise to teachers and other unionized workers in the nation's third largest school system, was voted down by the Board just before noon on June 15, 2011. The eight unions affected by the first action of the Board appointed by Mayor Rahm Emanuel are the Chicago Teachers Union, Service Employees International Union, Operating Engineers Union (which has two units), the Firemen and Oilers, UNITE-HERE, the International Brotherhood of Electrical Workers, and the Teamsters. The roll call was taken by the Board Secretary, Estela Beltran. As the names of the members were called in order, each of the following voted "No" — Henry S. Bienen, Mahalia A. Hines, Jesse H. Ruiz, Penny Pritzker, Rodrigo A. Sierra, Andrea L. Zopp and, voting last, Board President David Vitale. Earlier the Board had voted to make Vitale the Board President. International Union of Operating Engineers, AFL-CIO, Local 143-143B ("the Engineers CBA") (Engineers Bargaining Unit). Billionaire Penny Pritzker (above right) was one of seven members appointed to the Chicago Board of Education by Mayor Rahm Emanuel in June 2011 and seated at the Board's June 15, 2011 meeting. During remarks by Chicago Teachers Union President Karen Lewis, Pritzker, who is a director of several corporations including Hyatt Hotels (of which she owns more than ten percent) could barely conceal her hostility to the unions on whose behalf Lewis was speaking. Substance photo by George N. Schmidt.International Union of Operating Engineers, AFL-CIO, Local 143-143B ("the Financial Services CBA") (Financial Services Bargaining Unit). WHEREAS, each of the collective bargaining agreements, except the Financial Services CBA, require that the Board grant four percent (4%) increases to salary and wage tables for or wages of employees covered by those agreements effective July 1, 2011. WHEREAS, the Financial Services CBA requires that, effective July 1, 2011, the Board allot an amount equal to four (4%) of salary and wage as a pool for performance based increases for all employees covered by that agreement. WHEREAS, the collective bargaining agreements ("the CBAs") require that the Board adopt a resolution fifteen (15) days prior to the end of each fiscal year in which the Board finds that there is a reasonable expectation that the Board will be able to fund the agreed upon wage and salary increases for the various bargaining units in the upcoming fiscal year. 1. In accordance with the provisions of the collective bargaining agreements referenced in the recitals to this Resolution, the Board finds that there is a reasonable expectation that, in Fiscal Year 2012, commencing July 1, 2011 and ending June 30, 2011, it will be able to fund 1) in the case of the Financial Services CBA, a pool for performance-based increases equal to four (4%) percent of salary and wages of the bargaining unit employees; and 2) in the cases of all other CBAs, the four (4%) increases to the salary and wage tables or wages as provided in the CBSs. 2. The adoption of this resolution shall not impair or restrict the Board's inherent statutory, or contractual management rights generally, or, in particular, with respect to its management authority over its budget or over the size and composition of its workforce. 3. Nothing in this Resolution shall be construed to provide wage or salary table increases or, in the case of the Financial Services CBA, a pool for performance-based increases that is greater than that set forth in this resolution or agreed upon in the CBAs. The dramatic "No" vote took place following a presentation of more than a half hour during which the Board's new "Chief Administrative Officer" (who is so new that his name is not even listed at the Board's website). His name is Tim Cawley (although he is not yet listed in CPS documents), and he presented a Power Point which claimed to show the enormous deficit facing the Board. Board members each asked one or two obviously scripted questions to complement the presentation. 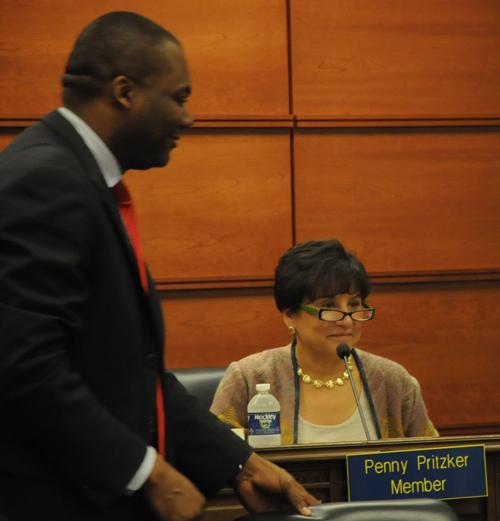 None asked for complete budgets, and all were satisfied with the content of the Power Point, as they subsequently voted in favor of its version of CPS fiscal reality. For example, the Board members focused on what officials claimed was another dramatic reduction in central office administrative costs, but ignored the fact that most administrative costs in CPS for the past several years have been in the ever-expanding area offices, which were ignored during the presentation. Members of the public are not permitted to ask questions of the presenters or Board members during Board meetings. During a time in which former Chicago Schools Chief Executive Officer Ron Huberman claimed that he was reducing administrative costs to the bone, Huberman's budget actually added more than $58 million to the area offices. If what the Board heard on June 15 as it voted to have a major confrontation with the unions is any reflection of the information the Board is providing for itself during an era in which its members claim to be seeking more "transparency" and "accountability," the fact that the Board members chose to ignore the expansion of the costs of the area offices is on indication that the gulf between carefully rehearsed words and actual deeds will remain a grand canyon. I commend the Board for their courage in facing the hard-truth of a $712 million deficit. I appreciate their vigilance in minimizing cuts to our children’s classrooms and their commitment to ensuring the public schools are accountable to Chicago’s taxpayers. In addition, I want to thank the dedicated teachers and administrators who will make the sacrifice in the interest of improving our children's education. I look forward to working with them to give our children the tools they need to compete and win in the economy of the future. George got that article done fast, I just got back from the Board meeting myself and he had the story out. I have a lot of questions about the power point presentation on the budget that was given at the Board meeting. I think Substance should do an article on that alone. I have a lot of questions about claims made by CPS that its teachers are now the highest paid big city urban teachers in America. I came away with a lot of questions and I think Substance should do an article on that too. As George explained the resolution was odd in that to revoke the raise the Board had to vote no. This completely fooled me and led me to think CPS was going to let the raise go through and the CPS would pressure CTU to give it up with yet a whole series of proposed cuts. Apparently the thinking was why bother with that dance go for the throat and kill CTU quick. The new CFO or Chief Admin officer, named Tim something, refused to give out numbers of positions likely to be reduced when asked by a Board member. He said it was premature. I also noticed when the Board members came out of closed session that Mr. Franczek the labor lawyer came out to, so apparently he was very critical to the discussion held behind the closed doors.